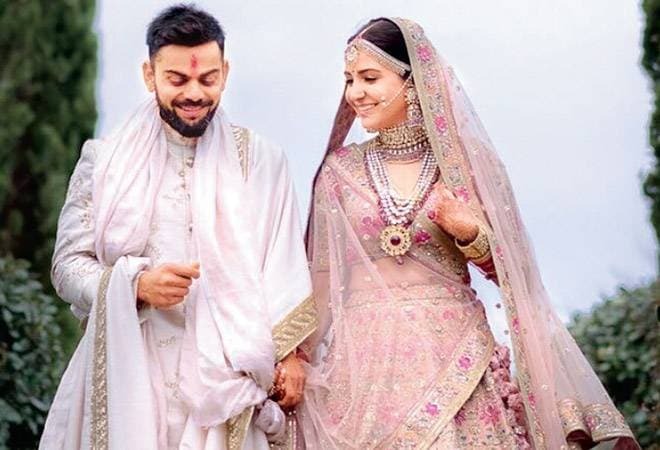 Finally, Virat Kohli and Anushka Sharma are married. The moment, pictures and video of the dazzling duo are already viral. The celebrity couple is now defined as a "power couple or a lethal combo", since both have a net worth of Rs 600 crore. Shailendra Singh, brand analyst and joint managing director of Percept Profile Ltd, told India Today TV: "I would say, this is the biggest moment in Indian brand market. Both make a power couple with equal strength and opportunities. I can easily predict that Virushka would have a net worth of Rs 1000 crore in next two years." Experts believe both are well-positioned brands available in the market. "Both will create a new category altogether of stability, family, true and loyalty. Products such as house loans, cars, insurance and so on, would start coming in", Singh said. According to a Finapp report, an estimated net worth of Virat Kohli and Anushka Sharma is Rs 382 crore and Rs 220 crore respectively. The net worth of Virat includes match fees, IPL salary and income from brand endorsements. For Anushka, money is coming from movie remuneration, brand endorsements, private investments and so on. Finapp has claimed that Anushka's net worth has seen a growth of over 80 per cent in last three years, with a prediction that her assets is likely to grow at a rate of 30 per cent and annual income by 18 per cent, respectively, over the next three years. As per the data available in public domain, Anushka charges around Rs 10 crore per film and Rs 4 crore per brand endorsement. She has a personal investment of nearly Rs 40 crore in real estates in Mumbai and across India. She owns at least four cars - such as BMW, Range Rover and Mercedes - worth Rs 5 crore. Virat earns an annual income of Rs 120 crore. With his worldclass records, he is one of the highest-paid celebrities and sports players in the world. He owns at least six cars worth Rs 9 crore that includes Mercedes, Audi, BMW and Volkswagen. Finapp report predicts that Virat's net worth will grow by 140 per cent in the coming years and so does his income. "Virat is a performer on and off the field. Anushka is a smart artist. She was never in the competition of Priyanka, Deepika and Katrina. She manages her career very smartly. The combination is brilliant. Not only they endorse some brands, but also endorse India as a brand", Singh added. As per the report, Virat and Anushka endorse around 28 brands together, such as: Head and Shoulders, Manyavar, Pepsi, Celkon, Boost, Audi, Fastrack, Goinee, Wrogn and Polaroid. Both are having their own business ventures. Virat runs a gym chain called Chisel and also a co-owns UAE Royals, a tennis team from Dubai. Anushka has her own production house, Clean Slate Films and her own apparel label called Nush. Singh concluded, "The way both have managed their relationship and positioned themselves, it is like wow."